The October 2010 Daring Bakers’ challenge was hosted by Lori of Butter Me Up. Lori chose to challenge DBers to make doughnuts. She used several sources for her recipes including Alton Brown, Nancy Silverton, Kate Neumann and Epicurious. We were actually supposed to post these doughnuts yesterday, but somehow the entire month got away from me and I did not get around to making these until today! I am so glad I checked the Daring Bakers' forums before embarking on this challenge because Audax had posted the most helpful information/tips! I was especially glad to see that Alton's yeast doughnut recipe could be adapted to the oven instead of the fryer. Not that I am afraid of frying things, but rather because we try to avoid eating fried foods as much as possible. This recipe was simple and not very time consuming at all (if you don't count the time it takes for the dough to rise). I always use my oven as a proofing box (by turning it on to preheat for a few seconds and then turning it off), so my dough easily doubled in size in one hour. I halved the recipe and ended up with plenty of doughnuts! Since I was baking these and not frying them, I didn't cut holes in the middle. I made smaller doughnuts, so they were done baking in only 8 minutes (at 425F). One of my favorite kinds of doughnuts is a maple glazed doughnut, but I did not have any maple syrup so I decided to glaze my doughnuts with a caramel icing. Thanks Lori, for hosting this month's challenge. These doughnuts were delicious and I had fun making them. You'll find the recipe for the doughnuts, as well as Audax's tips, and the caramel glaze recipe below. Make sure you check out the Daring Bakers' Blogroll to see how everyone else enjoyed these deep fried (or in my case - baked) treats. This recipe (the first challenge recipe) produces absolutely and utterly the best doughnuts I have ever had; the interiors of the doughnuts are soft, fluffy and airy (light as a feather) and the crusts are thin and crisp. The doughnuts are mildly sweet and with a coating of icing (powdered) sugar they are perfect. An absolutely marvellous recipe! It is best to think of the dough as an artisan (high-hydration) bread dough i.e. very soft and sticky. Work it gently and try to keep as much air in the dough when you are handling it. I have a lot of experience working with high-hydration (high ratio of water to flour) soft and sticky doughs so I had no problems with this recipe. If you feel the initial dough mixture is too sticky and soft don't add flour just let the dough rise; during this time the water will hydrate (wet) the flour and the dough will become less sticky and firmer (it will always be a soft dough) and the gluten will develop. Only add flour after the first rising (and only on the counter and the cutting tools you are using). 4. Don't worry too much about the look and feel of the dough on initial mixing, only really look and feel the dough after the first rising (if you only roughly mixed the dough at the beginning the rising time will be longer than the stated time in the given recipe but the dough will come together with full gluten development) then flour the counter and cutting tools use the minimum extra flour to help you cut, shape and re-rise the doughnuts so they can be deep-fried. If you're using a mixing machine just follow the instructions given in the recipe. Add all of the ingredients together in a small bowl and stir to combine. If you need your glaze to be slightly thicker, add a little more confectioner's sugar. If you'd like it to be thinner, add a little more milk until you reach your desired consistency. 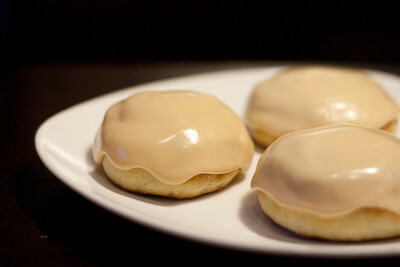 I have never had a doughnut with caramel icing but it seriously looks and sounds divine. long but very instesting and informative post...I love all the tips, I think they can be very useful for someone scared of yeasted doughs like me...and your douhgnuta look really great btw! Thanks! Your donuts look perfect! Now I'm wishing I had baked some of mine too. What gorgeous donuts! The glaze on top looks perfect. And I love that you baked them instead of frying them. 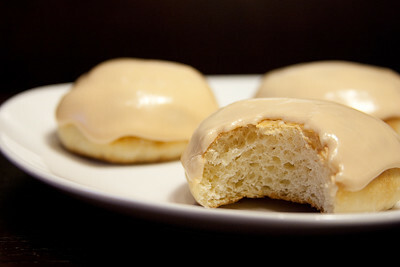 The fact that they are baked means u can have an extra serving right?LOL, The maple glaze looks divine! Those look amazing. I've always wanted to make doughnuts!! I love all your comments on the recipe. So useful! I've been wanting to make donuts but I'm so scared to even try. I think you've inspired me. I made donuts the other day and they turned out nothing like I wanted. I can't wait to try these! What gorgeous fluffy doughnuts! I've tried making doughnuts once and fried them, but really want to try baking them. I've been meaning to make baked doughnuts for quite some time, but haven't gotten around to it yet... I'm so curious, how does the texture of baked doughnuts compare to normal fried ones? The outer crust definitely looks much different.